The term “Palladium IRA” refers to a self-directed IRA that holds palladium coins and bars. Many investors are familiar with adding gold and silver to an IRA but are unaware that palladium may be included as well. What is Allowed in a Palladium IRA? The Taxpayer Relief Act of 1997 allowed for certain types of palladium coins and bars to be held in an IRA. The fineness must be .9995 or greater. Bars must be produced by a NYMEX- or COMEX-approved assayer/refiner or a national government mint. This coin was issued from 2005 to 2007 and again in 2009. 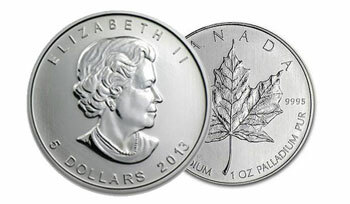 Created by the Royal Canadian Mint, it is considered the most popular palladium bullion coin. PAMP is the world’s leading precious metals refiner with a reputation for excellence. 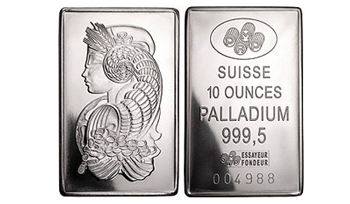 PAMP Suisse Palladium Bars are of the utmost quality and are readily permitted in self-directed IRAs. Savvy investors seek precious metals like gold, silver, platinum, and palladium to diversify their assets. If you already have gold or silver as part of your self-directed IRA, adding palladium can further diversify your precious metal holdings. American Bullion makes it easy to open a new self-directed Palladium IRA. Transfers and rollovers with American Bullion are tax-free and hassle-free. We handle all the details for you from start to finish. Call American Bullion at 1-800-326-9598 to speak with a precious metals specialist.